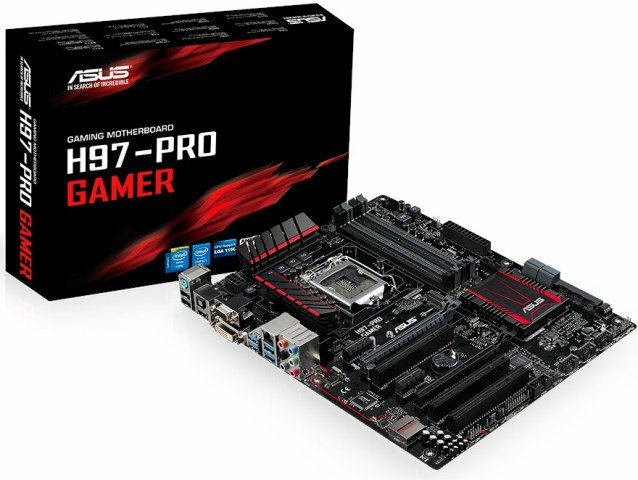 Asus has recently released a new gaming motherboard based on the new Intel H97 chipset – the Asus H97-Po Gamer. 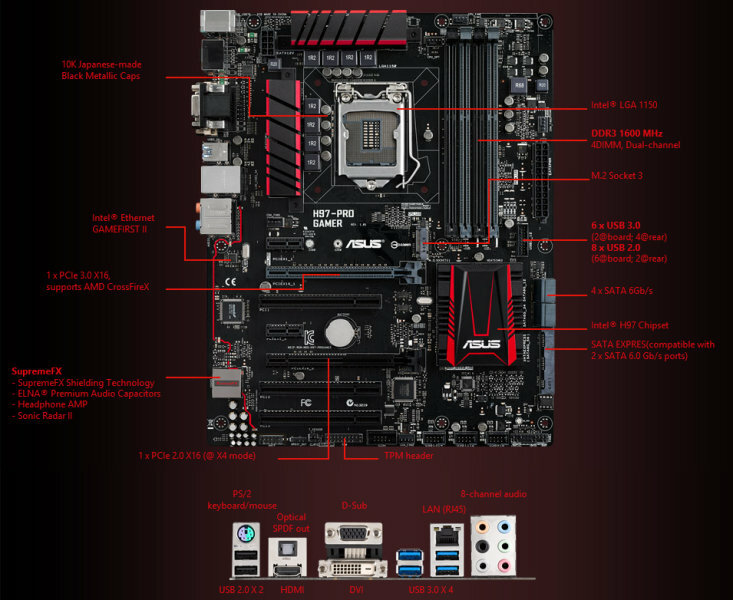 The said motherboard is built with the essential features that are geared towards PC gamers, but at the same time keeping it as affordable as possible. It’s built with game centric features like SupremeFX audio core, Intel Gigabit Ethernet and GameFirst II networking, Sonic Radar II, M.2 and SATA Express for faster storage solution, Gamer’s Guardian and more. Check out the rest of the Auss H97-Pro Gamer’s features and specifications below. The Asus H97-Pro Gamer’s networking is powered by Intel Gigabit Ethernet. This has the advantage of communicating directly with Intel processors to offer exceptionally-high Transmission Control Protocol (TCP) and User Datagram Protocol (UDP) throughput, lowering overall processing demands and improving efficiency – releasing more power for games and gameplay. Using independent network-assessment tools, ASUS engineers calculated that Intel Gigabit Ethernet deals with the UDP data packets that are vital for responsive gaming up to two times (2X) faster than competing gaming-LAN technologies. H97-Pro Gamer also has GameFirst II, an ASUS-exclusive traffic-shaping technology that reduces lag even further by prioritizing game-related data. Tests by ASUS engineers show that latency is greatly reduced – ping times are up to eight times (8X) faster with GameFirst II enabled. The EZ Mode lets users take advantage of low-latency gaming, with no need for expert knowledge. The Asus H97-Pro Gamer has the fastest storage connectivity in the shape of SATA Express and M.2. SATA Express provides data-transfer speeds of up to 10 Gbit/s from two PCI Express 2.0 lanes, ready for the next generation of super-fast SSDs and enabling H97-Pro Gamer players to speed up their game storage. The new motherboard also has a built-in M.2 socket with two native PCI Express 2.0 lanes for data-transfer speeds of up to 10 Gbit/s, so H97-Pro Gamer owners can choose their preferred method to speed up both storage and gameplay. Asus H97-Pro Gamer players enjoy SupremeFX technology for near-lossless audio with a remarkable signal-to-noise ratio (SNR) of 115dB that enhances every sound detail. The advanced audio chipset is isolated from electromagnetic interference (EMI) by a protective shield, preserving the integrity of the audio signals. Exclusive ‘red-line shielding’ horizontally separates SupremeFX audio components from the rest of the motherboard. This unique combination effectively eliminates analog interference to ensure flawless sound quality. Premium ELNA audio capacitors are added to the mix to deliver a warmer, natural sound to complete the audio experience. SupremeFX also has a built-in amplifier that drives high-quality headphones – all the way up to 300ohm impedance – for sound quality that’s as great as a dedicated sound card. H97-Pro Gamer also includes Sonic Radar II, an ASUS-exclusive technology that displays a stealthy overlay showing the precise direction and origin of in-game sounds. This helps players to hone their enemy-pinpointing skills and giving them the edge in FPS games. The Asus H97-Pro Gamer is engineered with high-quality, highly-durable components for exceptional real-world protection. We call these components ASUS Gamer’s Guardian. Gamer’s Guardian ESD Guards on the USB ports, audio connectors and Ethernet (LAN) port ensure that H97-Pro Gamer is actively protected against sudden electrostatic discharge (ESD). The result is that the components last much longer. The Asus H97-Pro Gamer also has the ASUS-exclusive DIGI+ voltage-regulator module (VRM) to enhance performance, increase efficiency and ensure reliability, and a stainless-steel back input/output (I/O) panel that’s chromium-plated and corrosion-resistant to last up to three times (3X) longer than traditional panels. Editor’s Note: Since this is based on an H97 chipset, don’t expect that you will be able to overclock your Devil’s Canyon or Haswell Unlock processor with this motherboard. The Asus H97-Pro Gamer also supports DDR3 memory up to 1600MHz, and supports only AMD CrossFireX. As of today, Asus hasn’t disclosed the manufacturer’s suggested retail price for the Asus H97-Pro Gamer. There’s no exact date as to when will it become available on stores yet, but I’m guessing it will become available in the following weeks to come. I;ll update this post once this motherboard becomes available to order online.